Some problems can’t be solved with fighting. They require magic. And what greater magic than the magic of forgiveness? 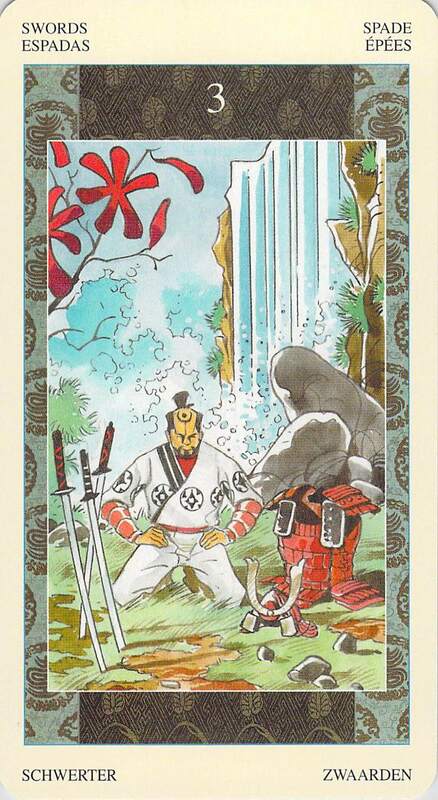 In the Samurai Tarot’s version of the Three of Swords, a samurai has set aside his weapons and taken off his armor. He is taking time in nature, next to a waterfall, to meditate. 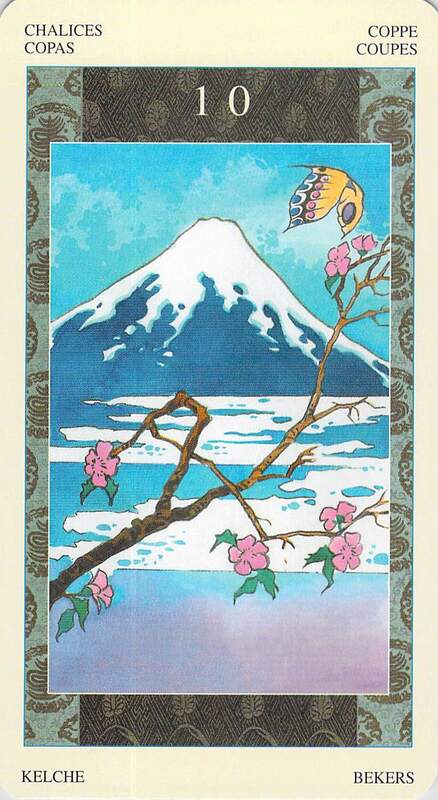 In his meditation is all the stillness of Mount Fuji. Through forgiveness and meditation, he is able to make all well again — first internally, and then, externally. There are situations that you can’t fight your way through, and the wise warrior recognizes when he has met one. And I want to say something further about forgiveness as magic. Forgiveness IS magic, one of the most powerful kinds of magic that there is. If you are looking for a miracle in your life, forgiveness is one of those tools that is just powerful enough to make it happen. True forgiveness from the heart, forgiveness not because you expect the person you are forgiving to change, and maybe not even because you have faith in that person that he or she didn’t mean to cause harm. Not because you think that person regrets his or her hurtful behavior and won’t do it again. True forgiveness doesn’t require mitigating circumstances. It’s based on unconditional love. Forgiveness is not being a doormat, though. The kind of forgiveness I am talking about is a kind of action to make the situation better. It’s a way of making an offering to the universe to change the karma of the situation. It’s a kind of intervention, actually. If someone has harmed you grievously, and that person is a family member who you are unwilling to exile or give up on (and the Ten of Cups here makes me think of family members), and you don’t have the heart for fighting (Three of Swords reversed) and you know that aggressive yang energy won’t help matters anyway, there are two options that lie ahead of you. A commonly chosen option is depression — not putting the sword down, but turning it (metaphorically or sadly, in some cases otherwise) against yourself. What I am talking about is the second option, the one that doesn’t involve fighting and doesn’t involve turning the sword inward. Forgiveness. This is NOT doing nothing. This is setting aside the power of yang and picking up the power of yin to transform a situation. If you haven’t played with the power of yin before you may not realize how powerful it is or that it can change not just your internal climate but the whole situation. Why? Because if you want someone to stop behaving hurtfully, you can’t accomplish it by hurting that person back. That person will naturally think he or she had better keep fighting and keep the armor on if only in self defense. Fighting precludes the one thing you need to have happen — you need to reach that person’s heart and touch it, opening it to the possibility of transformation. When you touch the heart, magic will happen. Understanding floods in. The sword falls to the ground. Don’t go thinking this tool of forgiveness is easy to use. Most people will find it safer to leave the situation or build a wall. It takes tremendous courage to lay down your weapons and be vulnerable at at time when you feel there is a risk that you will just get hurt again. And laying down your weapons, alone, won’t do it. You must at the same time generate your intention to call upon the magic of forgiveness. Consciously dedicate your action to the universe, to all sentient beings, to the situation, and to the person you are forgiving. Consciously tell the universe, as if you were addressing a court, “I have standing in this matter, and I am calling upon the universe to release the negative karma that this person has incurred in harming me. I am calling upon the universe to set things right.” It will take time before the person in your life will believe that the forgiveness is real and be able to relax and lay down his or her weapons, and allow his or her heart to be touched. And you will have to work to maintain that heart connection every day. Also, there is a chance that it might not work. Some people have surrounded their hearts with so much armor that it is impenetrable. But, swordfighting and using yang energy is not risk-free either. If you are determined to fix a family problem, if you are determined to stay in a situation and work with it, forgiveness and using yin energy to touch the heart is a tool that will surprise you with how powerful it can be and how much it can accomplish in terms of real change. If you are brave enough to try it. As a person who has deeply explored forgiveness both personally and professionally, I applaud the beauty and deep truth in your writing today. Love it, Green Tara. So wise, beautiful & heartfelt. Thank you for all you share and inspire within. 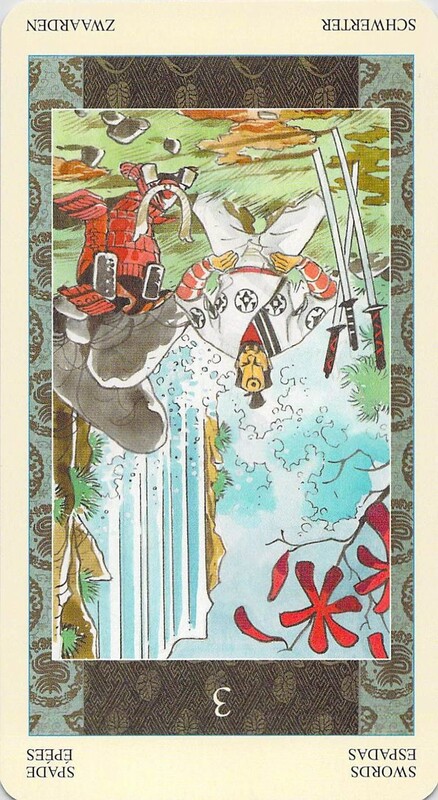 What if the 3 of swords is not reversed and it is next to the 10 of cups?